Robinson Kamura scored from the penalty spot to level matters as AFC leopards came from behind to draw 1-1 with Kariobangi Sharks in Machakos on Sunday. The game had an ill-tempered end with Sharks defender Mike Bodo sent off for an off the ball tussle. 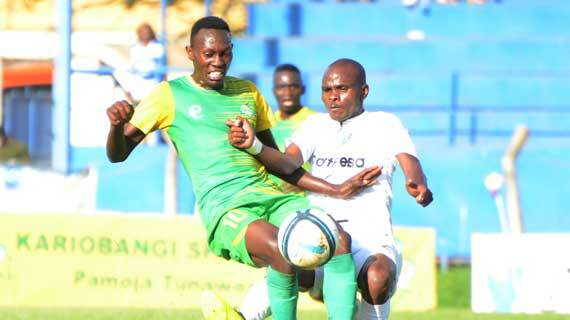 Harrison Mwendwa sent Sharks ahead in an entertaining match that however almost turned ugly at the tail end. AFC had their new assistant coach Marko Vasiljevic present, sitting in for Nikola Kavazovic who is still in Serbia attending to personal issues. AFC found themselves trailing when Mwendwa broke the deadlock with a superb goal, taking two AFC defenders to the cleaners before shooting low after being picked out by a brilliant Vincent Wasambo defense splitting ball. But the visitors got back on level terms seven minutes on the turn from the penalty spot after Geoffrey Shiveka handled inside the box. Skipper Robinson Kamura stepped up to take responsibility and he made no mistake sending Brian Bwire the wrong way. But Sharks were a constant menace all through and had chances especially with the lively Mwendwa. Duke Abuya had a chance trying out an overhead kick, but it went wide off a Mwendwa cross. The pace of the game intensified in the second half and AFC came close 10 minutes after the restart but Brian Marita’s header off a Dennis Sikhayi cross flew inches over the bar. Mwendwa continued with his destructive work on the other end, but again, action in the final third let Sharks down. The game almost degenerated into a fist fight towards the end with tackles flying all over the pitch and it ended in Bodo receiving his marching orders after an off the ball brawl.